Pamper your lips with EOS lip balms while you protect them from the sun with this irresistibly refreshing Broad Spectrum SPF 15 lip balm that's bursting with natural flavor. EOS lip balm in SPF 15 Lemon Drop is packed with antioxidant-rich vitamin E and natural conditioning oils to keep your lips moist and soft while protecting them from the sun. Fill is Made in USA. 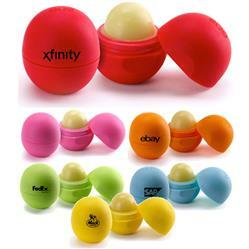 Did you know that EOS stands for Evolution of Smooth? FREE 3-DAY RUSH PRODUCTION AVAILABLE! Broad Spectrum UVA/UVB protection with 80 minute water resistant. PABA-free and 100% natural flavor. Shea butter & vitamin E smoothes on clear precisely glides on lips. Twist-off top and petrolatum and paraben-free, gluten-free, phthalate-free. 0.25 oz. Comes in yellow (lemon drop), blue (blueberry acai), green (honeysuckle honeydew), orange (medicated tangerine), pink (strawberry sorbet) and red (summer fruit). This is a lip balm that will be used and appreciated by anyone who knows quality. Available Colors: Comes in yellow (lemon drop), blue (blueberry acai), green (honeysuckle honeydew), orange (medicated tangerine), pink (strawberry sorbet) and red (summer fruit). Production Times Available: 10 day production. Rush available. Available Imprint Options: One Color Direct Imprint.